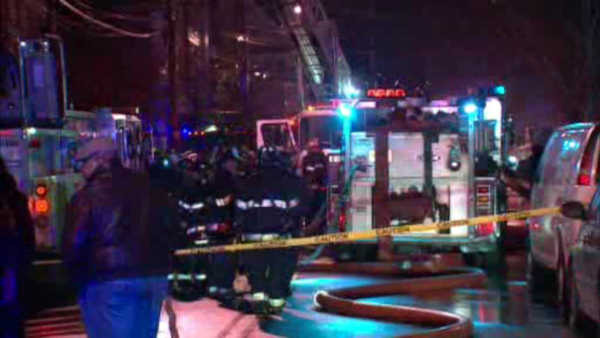 NEWARK, New Jersey (WABC) -- A 3-alarm fire in Newark has displaced 20 people and damaged several homes. The flames started just before 9 p.m. Sunday and spread to three residential buildings on Runyon Street. One brave passerby pulled a man out of one of the burning homes. Amazingly, there were no injuries reported, mainly because of that man's heroic actions. It took firefighters more than two hours to control the blaze. One firefighter was injured and treated at the scene. The American Red Cross is helping five families that were displaced.